Dr. Woodwell's Wood Elixir is a unique formulation designed to clean, rejuvenate and enhance all types of wood finishes. What sets Wood Elixir apart from other products is that it does all three tasks at once. 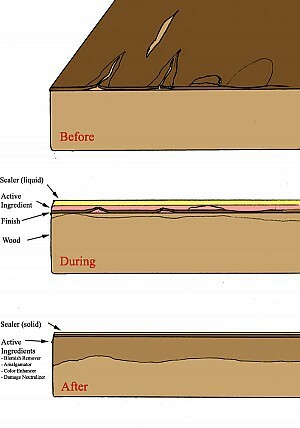 Wood Elixir solves cleaning problems such as removal of dirt, grime, mildew, grease, wax, dried-on food & beverage stains, sticky residues from tape or gummed labels, paint smears, paint or stain over-spray, chewing gum, lipstick, magic marker, grease pencil, crayon, lead pencil, ball-point pen ink, etc. While the surface is being cleaned, the finish is being rejuvenated. As well, damage to the finish caused by dehydration and excess moisture is being repaired through reamalgamation of the finish to the wood surface. Problems solved through this process include removal of white water rings, white hazing, scratches, cracks in the finish, finish separation from the wood, and, Wood Elixir reverses dry-finish flaking. 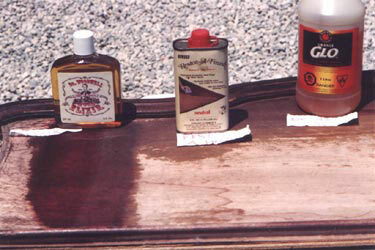 Wood Elixir can also be used to clean and protect painted surfaces, tin, leather, and decals! How does Wood Elixir compare? Fills scratches by adding color. Particularly helpful on some modern furniture where the color is in the finish, opposed to wood having been stained and a clear finish applied. Treats and beautifies the surface. By penetrating and imparting beneficial ingredients, Wood Elixir restore the existing finish instead of simply cleaning the surface. Once Wood Elixir cures, it offers additional protection against future damage. BriWax is an excellent protective wax. If the finish is damaged, flaking, or dehydrated, using BriWax (or any wax) will simply seal the damaged surface. We often see this on pieces brought into Dr. Woodwell Antiques for restoration. Dr. Woodwell's Wood Elixir will remove BriWax and re-establish the finish. Wood Elixir will restore the damaged finish, and cure to leave a thin, protective membrane. Numerous coats of Wood Elixir can be applied (allowing 24 hours between applications) to build up a hand-rubbed "French Polish" type finish. However, after restoring the original finish with one application, a good quality wax (like BriWax, or any wax containing carnuba) can be used to produce a higher-gloss. * Trademarks remain property of their respective owners, and are used only to identify products used in this comparison. Their use in no way indicates a relationship between Woodwell Products and the owners of said trademarks.